Th-INK-ing of You: Taking a Look Back at the May Release! Taking a Look Back at the May Release! Hello sweet friends! I hope you are all doing well and enjoying your week! Today, the DT is taking a look back at the May Our Daily Bread designs release! To see all the creations, you can visit the ODBD Blog. To learn all the details about each designer's creation please visit each one as linked below. I used the beautiful morning glory image from Glory, and the sentiment from Carried to Heaven. I also used the ODBD Custom Dies: Vintage Label Dies, Vintage Flourish Pattern Dies, and Fancy Foliage Dies. I decided I wanted my card front have a light and airy filagree feel, so I cut the Vintage Flourish Pattern Die, and then created a hinge that fits within the straight top part of the die by cutting the back of my card at an A2 size, PLUS about 1/4" along the long edge. I scored at 1/4" and folded and burnished the card. I trimmed off any excess that showed below the frame, and then adhered with tacky tape to the back of the Vintage Flourish Pattern Die. Now I have a pretty see through design for my card front. I then triple stamped my image on three different sizes of the Vintage Label Dies, colored my image, and stamped the sentiment on the smallest die cut. I lightly sponged the edges. Next, I popped each layer up and then added some of the flourishes from the Fancy Foliage Die set. My only other embellishment is a little white and pink bow. I like how this came out. I decided that I will put my message on another Vintage Label die on the inside, set right behind the front one so you don't see my writing from the front of the card. I hope you enjoyed my project, and that you'll take a few minutes to visit my DT sisters and be inspired by their awesome work! Grace...this needs a frame! Just beautiful, love the filigree look and the colors are so pretty! OH Grace, this is just so elegant..Lovely design and colors. Oh, Grace, this is delicate and so beautiful! It's stunning, and I love the layers and how you've used the beautiful foliage! And the colors are fabulous! Totally beautiful look-back for this month's release! Hugs, precious friend! Such a beautiful card, Grace!! My favorite colors and I love your layering of all those delicate dies and flourishes!! Your project is glorious!! Gorgeous card. Love everything about it. So pretty, Grace! Love how light and airy it looks and the two tone ribbon is lovely. I love everything about your gorgeous card, Grace…the colors, the way you layered the morning glories, and the flourish card front…just exquisite! Hugs! Seems everything has been said Grace. Your cards are always extraordinary. You should do more coloring too. It is very good. What a beautiful card Grace - so pretty and sincere. 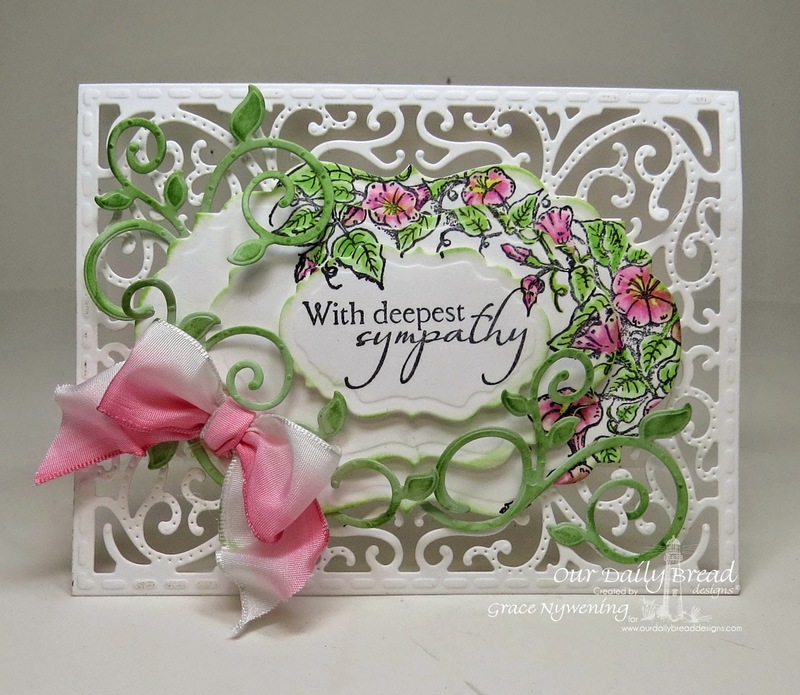 Love the feel of this dainty die layered up with this darling colored image and sentiment! And that bow is yummy! Thanks for inspiring me Grace! Oh my!! What a wonderful creation Grace!! Absolute stunner! The quote is actually so very well said through this card. Love this card, such a great design! So pretty too!! Thoughts of You and continued blessings! You have blessed my life! I'd like to bless you! A surprise party and an old pick up truck! To God Be the Glory and Free Shipping! A Whispered Prayer and a little change! Welcome to the ODBD May Release!